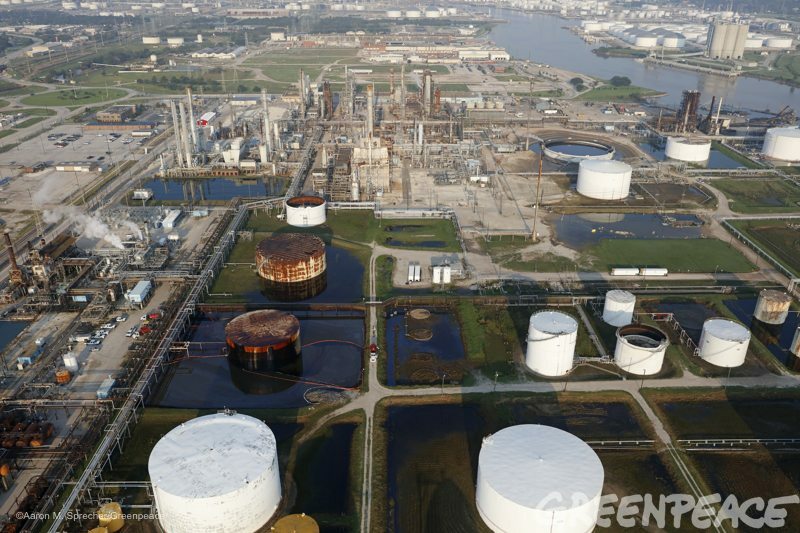 Reports filed by companies to the Texas Commission on Environmental Quality (TCEQ) show that over 5.7 million pounds of air pollution were released by chemical plants, oil refineries and industrial facilities in the month after Harvey made landfall. 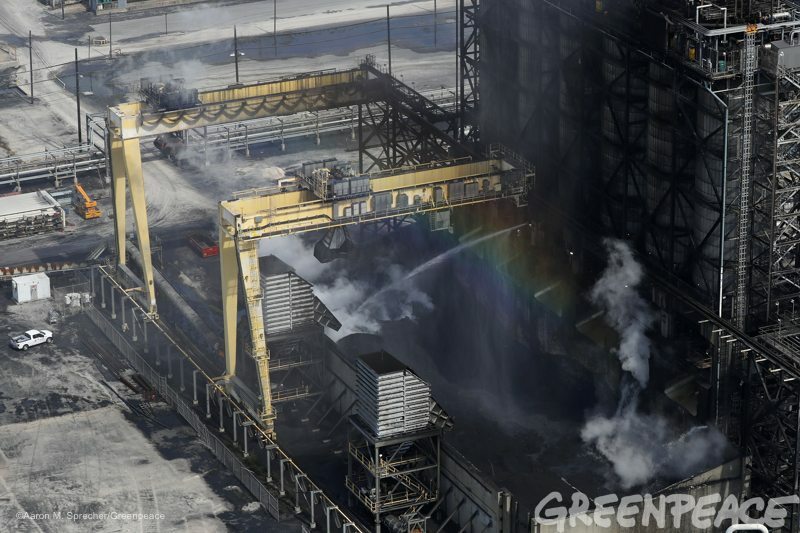 90% of this air pollution was released by 13 companies. Click for full-page Hurricane Harvey Air Pollution Database. Scroll down for Methodology & References. 43 out of 45 facilities with available data are located in communities that are disproportionately inhabited by people of color (excludes 11 facilities without available data). Environment Texas and TexPIRG: Worried about pollution after Harvey? Earthjustice: see posts on Harvey written by Diane Carman, Mollie Fager, and Keith Rushing. Activities at a refining plant in Port Arthur, Texas more than a week after Hurricane Harvey slammed the area. The human impacts of Hurricane Harvey have been staggering, and the greatest concern is for the people struggling in its aftermath. 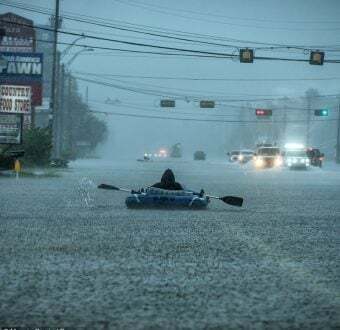 This disaster makes clear once again that coastal Texas and the wider Gulf region are on the frontlines of sea level rise and extreme weather heightened by climate change, as well as the toxic impacts from fossil fuel infrastructure. Laura Blewitt, In ‘Energy City’ USA, Hurricane Harvey’s Fury Is Still Lingering, Bloomberg, Oct. 19, 2017. Workers in protective suits stand in the middle of oil covering Hurricane Harvey flood waters at a refinery in La Porte, Texas, more than a week after the hurricane hit the area. The human impacts of Hurricane Harvey have been staggering, and the greatest concern is for the people struggling in its aftermath. This disaster makes clear once again that coastal Texas and the wider Gulf region are on the frontlines of sea level rise and extreme weather heightened by climate change, as well as the toxic impacts from fossil fuel infrastructure. Data collection began on September 5, 2017, with help from Athena Matyear. There were only 39 final reports filed at that time. This limits our data, as final reports replace the initial reports on the TCEQ website after being filed (out of 143 final reports). Thus, 39 initial reports filed by 26 distinct facilities are missing from our collection. For comparison sake, we included the ability to swap between data from initial and final estimates of pollution reported to TCEQ. Users can see which companies initially underestimated their air pollution, and which companies over-estimated the extent of pollution. We included every incident reported to TCEQ Regions 10 (Beaumont), 12 (Houston) and 14 (Corpus Christi) from August 23, 2017, when many refineries began to shut down, to September 25, 2017, a month after Harvey made landfall. We also included data from other TCEQ regions when reports clearly indicated that the pollution was a consequence of hurricane Harvey. As of October 24, 2017, not all final reports have been published. 20 final reports remain un-filed. Many of these reports are “opacity events,” an industry term for smoke pollution at facilities, which are not measured in pounds and will not affect current totals. We merged a few groups of chemicals for the sake of simplifying some of the data that is displayed. We consolidated various types of butanes, butenes, pentanes, pentenes, and xylenes, which were (infrequently) reported by companies with specific isomers or variations. We merged “xylene, mixed isomers” and “xylene-n” into “xylenes,” as an example. We also combined nitrogen oxide (NO) and nitrogen dioxide (NO2) to display as “Nitrogen Oxides (NOx),” as both chemicals have similar effects in terms of acid rain, smog formation, and human health. All other chemicals are listed exactly as companies reported them. If in doubt, follow our sources to the TCEQ website and look at the exact entry by the company. In many cases, the TCEQ reports filed by petrochemical and industrial facilities are credited to the company that owns or operates the facility, but not the ultimate parent company. To the best of our ability, we have identified the ultimate parent company of each of the subsidiaries that filed reports. Each TCEQ has a six-digit number attributed to it. Adding this feature as a row or column of the database allows you to click on individual cells and open up the primary source data, and a link to the TCEQ page. 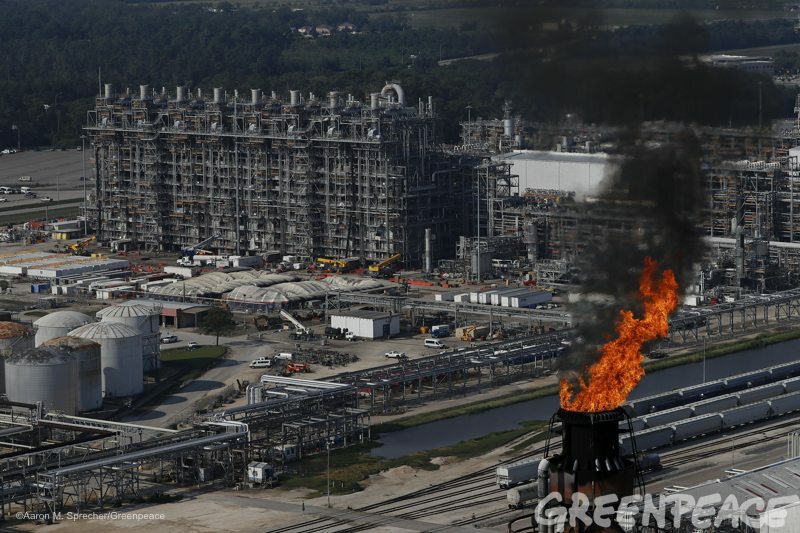 Many of the facilities that were hit by Harvey are very large, and emitted air pollution from several distinct areas within the facility. 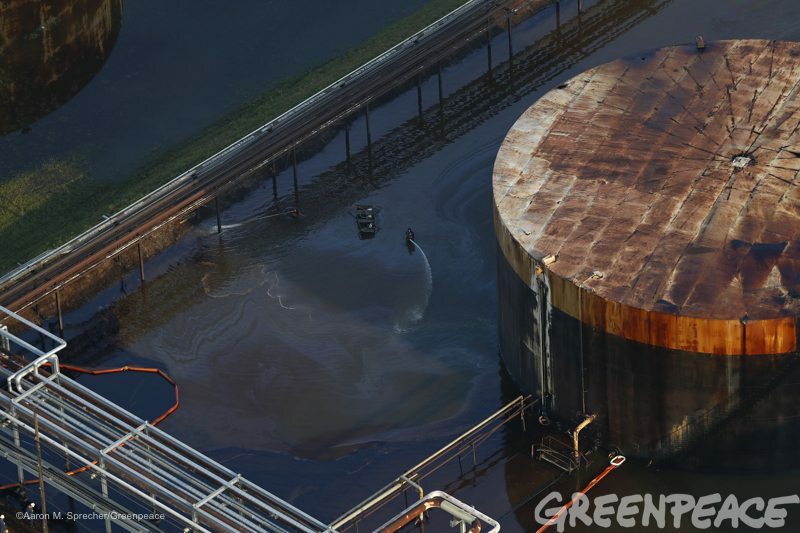 The TCEQ reports specify which equpiment that chemicals were leaked, spilled, or flared from. This data is displayed as “Population Living in Poverty (%)” and “Population People of Color (%).” It is only applicable to specific facilities–for example, the data will not display as averages if you attempt to apply “Population People of Color” to the county of Brazoria, or to all facilities owned by ExxonMobil. For the MPLX Javalina plant in Corpus Christi, PERI data from the closest Air Products facility in Corpus Christi. A flare burns at an oil refinery in Baytown, Texas more than a week after Hurricane Harvey ravaged the area. The human impacts of Hurricane Harvey have been staggering, and the greatest concern is for the people struggling in its aftermath. This disaster makes clear once again that coastal Texas and the wider Gulf region are on the frontlines of sea level rise and extreme weather heightened by climate change, as well as the toxic impacts from fossil fuel infrastructure. Our source spreadsheet is available for download, below. Primary sources directly from TCEQ is easy to access, via a pop-up menu, by clicking the any of the cells in the database while the “Source Report No.” realm is included. 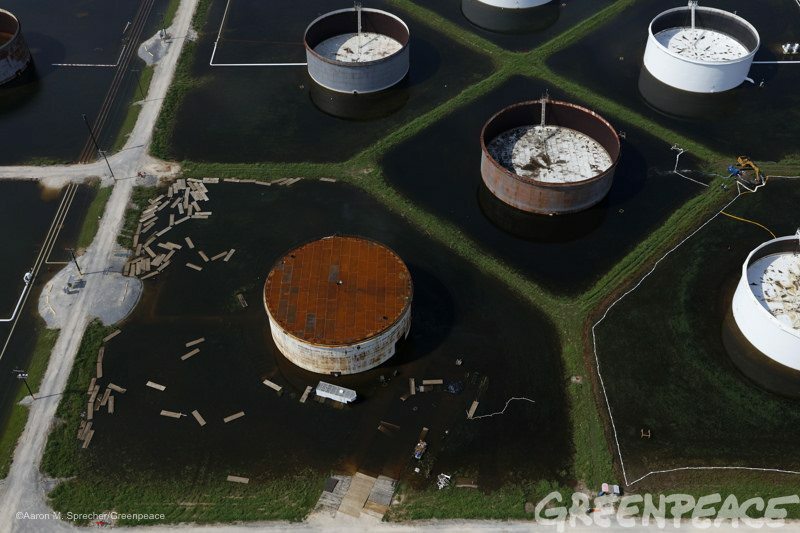 Greenpeace compiled air pollution reports submitted to the Texas Commission on Environmental Quality (TCEQ) that occurred during the Hurricane Harvey disaster. TCEQ reports submitted by petrochemical refineries, chemical plants, oil & gas compressor stations, terminals, and other industrial sites provide estimates of the type and amounts of chemicals released, in pounds. Data includes pollution from the shutdown and start-up process for many refineries and chemical plants, as well as releases due to physical damage from Harvey. This data is voluntarily reported by the facilities and companies. There were no official air monitoring efforts by state or federal officials during and after hurricane Harvey, and thus, no way to verify data submitted to TCEQ. 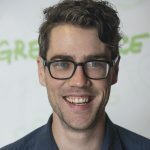 Greenpeace’s database does not include filings to the Texas Railroad Commission, the U.S. Environmental Protection Agency (EPA), the U.S. Coast Guard, or any other government agencies. Data does not include estimates of chemicals released from Superfund sites, Brownfields, sewage and water treatment facilities, or other potential point-sources of air and water pollution reported after the storm.